I had a space in the morning so dipped into the Metropolitan, and chose the Northern Renaissance in order to stop being overwhelmed. 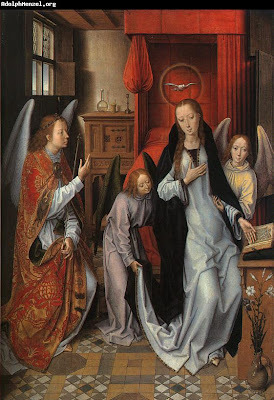 I spent my time with two Annunciations by Hans Memling. They are calm and intimate. In both, Mary demurrers her assent by pointing to the book she is reading, implying it is written, I can do no other. But she could. She is a free agent. The story needs its wonder restored - what is it that moves this particular woman to accept the divine burden, what is it in her that gives the divine birth? This mystery is only driven back by her own stainless conception! Is it simply that the divine son must arise out of a pure consciousness. It is not assent that Mary offers but recognition that the angel brings. She is recognized as a sign of the purity of consciousness that gives rise to divine incarnation. If we wish to be newly born, it is the creation of a vessel that can bear that truth, that is required of us. 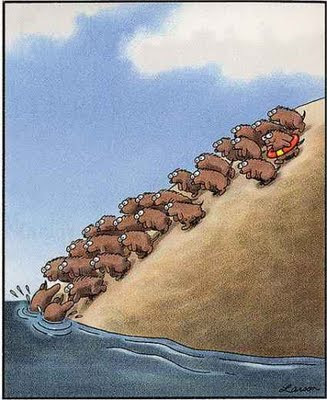 I remember a cartoon of a small furry animal sitting on a psychtherapist's couch, looking anxious, and saying to the therapist seated behind him, 'Depressed, depressed, of course, I am depressed, I am a lemming'! I was sitting watching the people throng the streets need Grand Central Station, New York, enjoying the first real sun of Spring and the opportunity of sitting out on the pavement (as I was) talking, eating and drinking. It was a vibrant city scene. But I had a jaundiced day, was feeling confused and uncertain, and so had come out to relax and brought my current book for company, that and the opportunities to people watch, over a glass of wine. Today I went to see the Nesterovs at the Tretyakov. They are signs of a coherent vision - of a Russia that is holy because it has grafted a Christian spirituality that has humility at its heart onto the spirit of place. The inherently muted tones of the landscape and its simplicity merges with the demands of the heart for coherence and a given openness to place, and to others. Three elderly monks sit on a tree stump at lake and forest's edge greeting a fox as he emerges, without fear, from the trees. 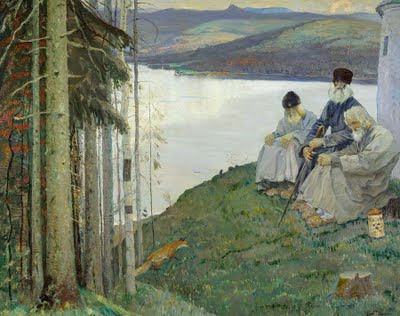 In their vision paradise is restored and one of the monk's looks at the viewer invitingly asking them to join this reality - to let grace in, grace that configures the world, waiting on our discovery. But it is a vision whose ideal was undermined by the real divergence between it and the actual contours of religious life in Russia and by darker forces. It is an unprepossessing building on a hillside, outside the village (that has a new church), overlooking Lake Prespa, whose still waters are shared between Albania, Greece and Macedonia. St George's Kurbinovo is in Macedonia. You have to wander the village in search of the key as the building is usually locked: the number of visitors small. 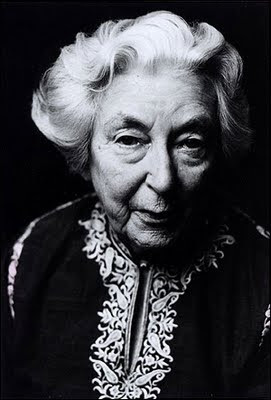 It was how I first came to it one September afternoon with the artist, Patrick Pye, and his wife, Noirin. They had come to visit me following Patrick's retrospective in the Royal Hibernian Academy when the Irish art world, entrenched in its secularism (for understandable reasons), decided, after all, that Patrick was a very fine painter, even if he persisted in the pursuit of sacred, Christian themes for his art. But in arriving, that late recognition had its consequences. Noirin took me aside when they arrived and shared her concern that Patrick was feeling 'painted out'. Skeletal figures in a bare, unfeeling yet sacred building stare into the grey ground in which rests a stripped skeleton like themselves yet without animation. Death as actor peers down at death as end. 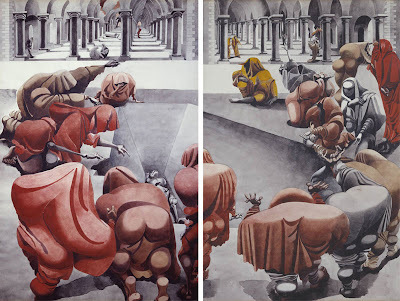 This extraordinary dual painting by Edward Burra was completed in 1940. It speaks of its time when death stalked the world meeting its products everywhere. Both paintings are in Tate Britain's new 'Watercolour' show that wishes (and successfully) shows that watercolour is a diverse medium of great versatility from the particular clarity of illustration (with beautiful examples of flora and fauna painting) to the visionary haunting creations of Burra. It was a long cycle ride for tea at the Limes across the Oxfordshire countryside more than twenty years ago. I was the 'programme co-ordinator' at The Abbey: an experiment in therapeutic living and Christian life that was flawed by two gifted founders with unacknowledged differences of vision (and practice). I was going to visit Michael, one of the Abbey's trustees, to explore future life options. I had an idea for a 'vocation network' that I wanted to try out on him (that probably required the new social media, then not thought of, to be realized in practice)! We had tea in that unique house, part aged, part creation of Jenny, Michael's energetic, creative and eccentric wife, now sadly dead and we became friends. Michael helped find me my first real job in the charitable sector with a trust of which he was trustee (and with which I remain connected). In her 1946 novel, The River, the author, Rumer Godden, describes her heroine's response to writing a poem she knows to be good: "It felt alive, as she did. She felt alive and curiously powerful, and full of what seemed to her a glory." They are hallmarks of her own writing. She said she often came to the precipice of melodrama or unalloyed sentiment but stepped back. She stepped back into a clear eyed vision of how people relate to one another within the microcosm of families or enclosed communities (two of her novels are famously set in convents) and between cultures - most commonly that of the English and of India. One of her favourite patterns is of the transition between childhood and adulthood, when an event and its unfolding consequences, often tragic, propel a child into a new maturity. She has a mastery of depicting how children see the world and how they oscillate between their own and an adult's world, learning to comprehend. 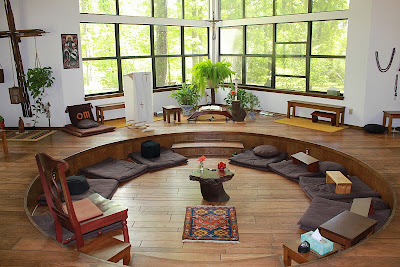 This the chapel/meditation space at the Forest of Peace (in Sand Springs, near Tulsa, Oklahoma) that is an ashram modeled after that founded by Father Bede Griffiths in India. It is set in a beautiful ground of trees that stretch out and down towards the Arkansas river. 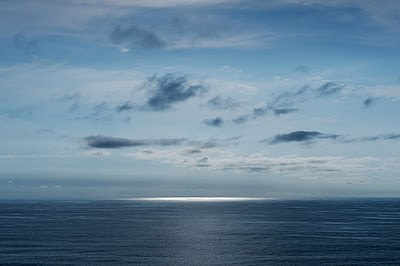 While being a Christian place, it quietly, symbolically embraces the signs of other traditions, fingers pointing to the one light that transcends all, what that remarkable German mystic, Jakob Boehme, called the inner centre that embraces all outwardness. It is a beautiful, peaceful spot, and I have sat there in silence, singularly and communally, for many hours but it has always been the woods that have been the space of greatest peace - to step out into them, walk and wander, lose oneself in their mixture of light and shade, to sit still, look out and down at the distance river, restored to a sense of unity. Then what is afraid of me comes, and lives awhile in my sight. What it fears in me leaves me, and the fear of me leaves it. It sings and I hear its song. What I fear in it leaves it and the fear of it leaves me. I hear my song at last, and I sing it. As we sing, the day turns, the leaves move. 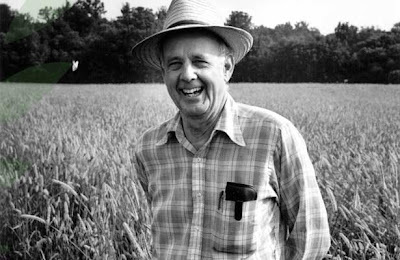 I sat opposite Wendell Berry, and his wife Tanya, one day at breakfast. It was a conference, the first Temenos conference, and I did not know who he was, excepting that he was one of the speakers - both giving a lecture and a poetry reading. This beautifully written book is the result of a year's exploration of the author's locality - both actually as he teaches at the University of Essex and in history as the place from which his immediate ancestors come. The given geography is East Anglia: Essex, Suffolk and Norfolk. The local is exposed as hiding much that is unknown - geographies unexplored, ways of being and living un-encountered - and much that represents the wild. You do not have to travel outside your immediate geography to a find a world that resists human containment - that goes its own way, often subversively to human purposes. Wildness is a necessary substratum of all that lives. In spite of the title, this translucent watercolour reminded me of Spring. It struck me today, coming back from Durham, as Spring's stages changed with latitude, brought home its dynamism, the latent energy of renewal. 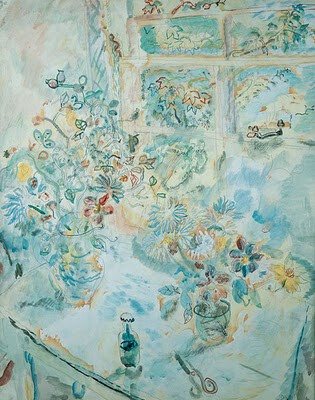 David Jones is one of those quiet poet-painters whose work sits waiting discovery that in more celebratory nations would be articulated to prominence but here is sadly not. He remains the best chronicler of the First World War, in 'In Parenthesis' in whose trenches he served - both in finding war's meaning and the collapse of that meaning in the second half totalitiy of its brutalities. Mrs Thatcher of troubled past memory once sought to deny the oxygen of publicity to Republican groups in Ireland who were committing acts of terror both in Northern Ireland and in mainland Great Britain arguing that an essential element to the hoped for success of their campaign was the publicity they received. The only problem with this approach is that those groups represented both wide constituencies and an historic grievance. A reality that ought to be legitimately reported on by the media. I was reminded of this by the actions of Terry Jones because, by contrast, he is a person who might benefit from being deprived of the oxygen of publicity. Since he represents no one - his purported church appears to have no more than a hundred members; has no recognizable grievance with Islam: and, has no creditable criticism of Islam (that would warrant anyone listening to him beyond his local bar stool).